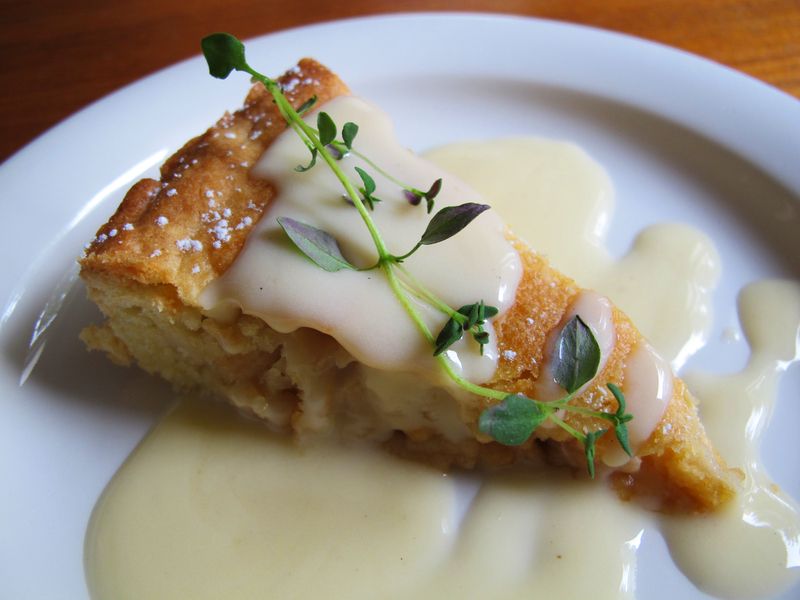 There is a saying “as American as apple pie,” but I think you could just as easily say “as Swedish as apple cake.” It’s everywhere and I certainly see it on menus here much more than I ever see apple pie on a menu in the U.S. This particular recipe has been a favorite of mine ever since I first tried it at my mother-in-law’s probably a decade ago. She has been making it for so many years she no longer remembers where the recipe came from. It is just one of many gems that have been written out by hand and filed into a ‘recipe favorites’ folder. It’s not really a pie, but not a cake in the traditional sense either (at least as Americans would think of a cake). But in Sweden this definitely counts in the kaka, or cake category. I had a hard time deciding what to call it so I appreciated the suggestions I got to stick with good ‘ol Swedish apple cake. I have mentioned before I am not much of a baker. One of the reasons I like this recipe so much is that it doesn’t intimidate me like a pie or a tart. It’s very forgiving. Once you mix the dough you press a portion of it into the base of the springform pan and the other part is rolled out and doesn’t need to be fussily or fancily connected to the base. The end result is way more presentable than any pie I will create in my lifetime. I’ve already made it three times this season. The first time I forgot to photograph it before it got dark outside and there was no way I could wait until the next day to eat it. My second attempt got overbaked. Despite it’s dark crust, it still tasted great but wasn’t so photo worthy. What you see pictured is cake number three and it was deeelish. I used Kaisa apples that we picked at my in-laws but any fairly sweet baking apple will do although I’d avoid apples that are too tart since there isn’t a lot of sugar in the crust and no sugar is added to the grated apple filling. 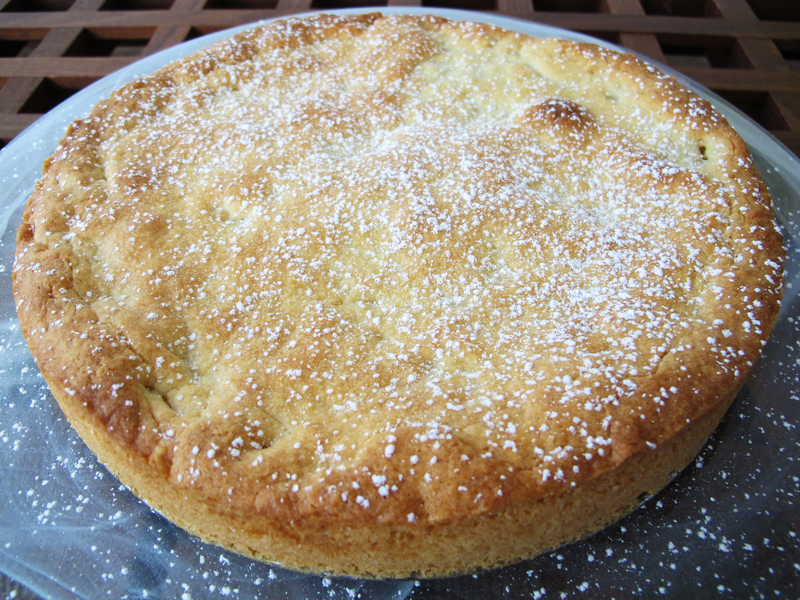 In the final product the fresh apple flavor really shines through and is well complimented by the simple, buttery crust. Vanilla sauce is a traditional accompaniment, but of course you can use whipped cream or ice cream. I have even topped it with a bit of dulce de leche before. So for those of you out there who are looking for something a little different, or have the same aversion to making pies and tarts that I do, welcome to a simple solution and a Swedish staple dessert. 1. Preheat the oven to 390°F (200°C). Butter the bottom and part way up the sides of an 8″ springform pan. 2. Blend all of the dry ingredients in a large mixing bowl. Dice the chilled butter and cut it into the dry ingredients using two forks or a pastry cutter. When the mixture looks like course meal, add the egg mixing lightly to incorporate (*note that if you are using vanilla extract rather than vanilla sugar, you can beat the extract with the egg before adding to the dough mixture). Use your hands to knead the dough into a ball. Divide the dough into three parts. Press two parts into the base, and part way up the sides of the springform pan (about 1/2″ or 1.2cm). 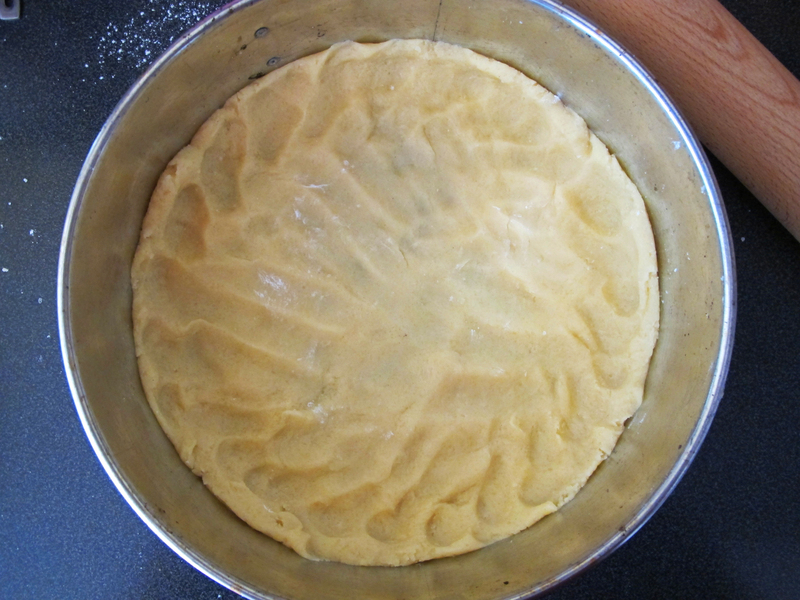 Roll the remaining dough out between lightly floured waxed paper to form a circle large enough to cover the top of the cake. Set aside. 3. Peel, core, and grate the apples using the largest holes on the grater. If you work quickly the apples won’t brown too much. Dump the apples into the springform pan and lightly press them down. Make sure none of the grated apple is touching the side of the pan because you want dough-to-dough contact when you add the top crust. 4. Gently lay the top crust over the grated apples. Press the crust down around the edges of the pan to adhere the top and bottom crust. If any tears or wholes form in the crust carefully pinch/stretch them together. 5. Place the pan in the preheated oven and bake until golden, about 20-30 minutes. Watch it carefully because it can overbake quickly. Remove from oven and let cool completely. 6. Dust the top with powdered sugar, if desired. Serve at room temperature or chilled with vanilla sauce. Combine the eggs, sugar, potato flour, and milk in a saucepan and bring to a simmer, stirring constantly, until it thickens. Be careful not to let it boil. Remove from heat and stir in the vanilla. Avoid using a steel wisk at any point as it can turn the sauce a grayish color. Once cool, you can serve the sauce as is or fold some whipped cream into it. We just had our first frost and will be picking apples this weekend and Nabil’s. I will be trying out this desert as soon as that is done. I personally like the name Swedish Apple Cake. I like it better than grated apple cake. It lets you know where the recipe came from. Swedish apple cake it is. Hope the cake works out well for you. I love it. Try throwing some lingonberries in there. I bet that would be incredible. Well I made this today and really enjoyed. Picked about 65 pounds of apples and am working on turning them into a bunch of different items. I loved how this dish isn’t overly sweet. You get a nice flavor to the apples and the crust is really nice. Enjoyed the vanilla sauce with it as well. I bet this would be really good made with pears too. Just a thought. Glad you enjoyed it! I tried it with pears once and it didn’t work, but that’s not to say it isn’t worth trying again. I’m not sure about the lingonberries though. They are really tart so then you would probably need to add some sugar to the filling and the baking time is so short they might not ‘cook down’ enough. But if you give it a go with lingonberries, let me know how it turns out. I’d love to try it with the ligonberries but alas, I have no lingonberries here. But I would think if you grated them, and don’t put in a lot, maybe grate them on the fine side and scatter them in with the apples, that it would make a nice compliment. Taking some of the cake to Mom and Dad this morning so they can have it with their dinner tonight. Hey Marla. Lingonberries are really small, the size of wild blueberries or petite peas. Grating them would be tough. Maybe pulsing them in a food processor to chop them up a bit? Anyway, I’m pretty happy with this apple cake as it is and don’t have any plans to mix it up any time soon. But if you try it with pears or otherwise please do let me know how it turned out. Give my love to mom and dad. Hi! I made this today and it was a big hit! Thanks for sharing the recipe. I am not normally one who is into dough making but this was really simple and I managed to make it while I have both kids with me in the kitchen. DH just said that it’s the best apple cake he’s had for a long time!!! Thank you so much for sharing what a success this was for you. I’m so glad to hear you enjoyed it. I’m not much of a dough person either but I find this recipe is really doable. Enjoy! Yum! 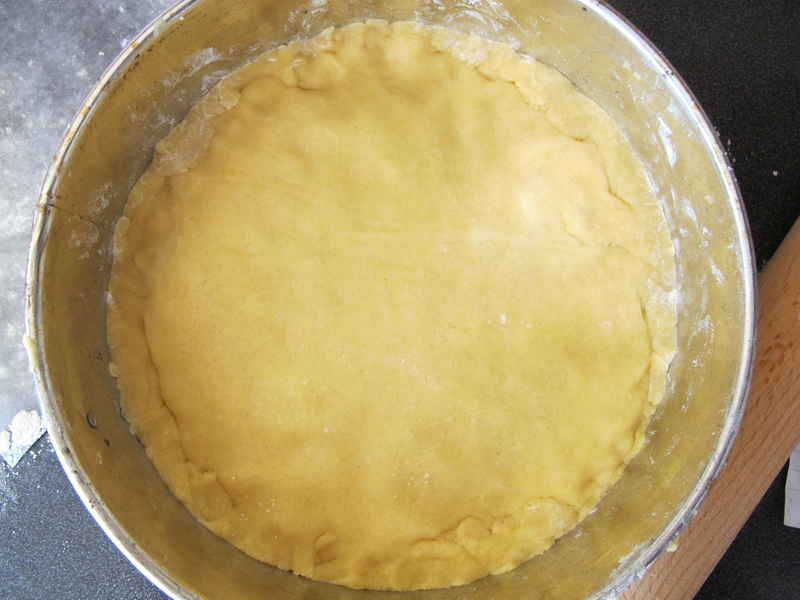 I’m basically scared of making pie dough…I always force Anders to do it for me, but this recipe sounds amazingly easy! I have the pie dough fear as well, so I completely understand where you are coming from. Getting the top of this rolled out and placed is a little tricky, but for me it’s much less intimidating than the pie scenario. Give it a try, and if you do, I’d love to hear how it worked out for you. Just finished my second slice of this wonderful cake and want to send my tusen tack for the recipe and your fantastic site, which i found today. Seems like cold weather has finally arrived for good, and is inducing Fika Frenzy in our house. The oven is finished its summer break and i’ve discovered the magic of a French coffee press . . . here come the sju sorters! Forgot the sugar in the dough (which comes together quickly in the food processor) so i did an egg wash and sprinkled a bit of sugar on top. Used Rome apples and the result was så fint ! Thanks again Maia, your site is jättebra! So nice to know that you are really enjoying the apple cake and the site. You are welcome back any time. I have been searching all morning for an Apple Cake recipe and low and behold who should I find but another expat in Sweden and what appears to be an awesome recipe to try. I love the addition of the Vanilla Sauce and will be making this later in the week. Welcome to the site Zelda. I really do love this recipe. If you do give it a try I’d love to hear your thoughts. Föreningsgatan 30, my favorite place for produce in the neighborhood. Have you been? Hmmm, maybe I need to post it under breakfast and brunch too! 😉 I’m all for a little treat in the morning. Thank you for taking the time to write that you enjoyed it. I haven’t been to the produce place you mentioned. It’s a bit out of my neck of the woods. Do they only do produce, or is it a general market? R ö t t e r mainly has local produce but it also sells bread from Chez Madame, candles, jams, and other bottled food items. It’s a small store, more of a boutique I guess. I just read your post about Spettekaka and turns out that bakery is across the street from my apartment! I’ve always wanted to give it a try so it was great to read the history and see the baking process. I can’t wait to pick some up. Thanks again! Rötter sounds great. I’ll have to check it out. And definitely give spettkaka a try. It’s not for everyone, but it’s worth trying, even if you only go for the bits in a bag. Glad you enjoyed the post. Hi, I am going to try this recipe this week. I just have one question. In the ingredient’s list you mention the vanilla extract, do you add it with the dough or with the apples as I didn’t find it among the directions. thanks for sharing this recipe. Thanks for pointing out that issue. If using vanilla sugar, you would add it to the dry ingredients for the dough. If using vanilla extract, you can add it to the lightly beaten egg, and then incorporate that into the dough. I really do love this recipe. I hope it works out well for you. I came to your blog for the vanilla sauce recipe. I have tried many Swedish recipes but the hubby says they aren’t quite right. I think this may be the one! It took me 4 years and several different classes to get somewhat of a handle on the language, but I am nowhere near fluent. I don’t get as homesick anymore, but I do miss home. I’m glad you found my blog too! I have aspirations to get more active with it again, but between full-time work, kids, and all the rest that life entails it’s tough to find the time. I have been in and out of SFI three times. I speak enough to get through the grocery store but that’s about it. A friend in class told me once, and now I believe it to be true, that I would start speaking Swedish when I really, truly wanted to. May I ask a question that has nothing to do with cooking? 🙂 I have finally jumped through all the hoops required to get a driver’s license, now just for the written and the behind the wheel. I have purchased online practice tests but the translation from Swedish to English is awful, I cannot even understand what the question(s) mean. Is that how the actual test is? Almost impossible to understand what they are asking? I guess I am assuming you took the test in English, but perhaps you took it in Swedish?